Rodney McAree admitted feeling slightly frustrated after missing out on Michael McCrudden in the January transfer window. 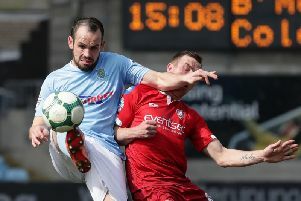 The striker has opted to remain with Institute for the rest of the season despite interest from both Derry City and the Bannsiders, but McAree hasn't ruled out going back in for the player, who will be a free agent in the summer. "It's a little bit frustrating we couldn't get anything done now," he admitted. "Whether anything can be done further down the line that's probably our next objective. "We have to put closure on that pretty quick. "As soon as this window shuts we will be looking ahead to the summer and looking to how we can improve again and see who's maybe going to be available."